Born in 1981 in Japan. Moved to Australia with his family at the age of 9. A multicultural individual who’s half Chinese and half Taiwanese by blood, and an Australian national. Began the violin from a very young age and has absorbed musical essences of classical, rock, and jazz music, which he incorporates into his music to make his own unique sound. Is fluent in Japanese, English, Chinese, and Taiwanese. A truly borderless individual with a borderless music that does not lie solely within the realms of classical music. 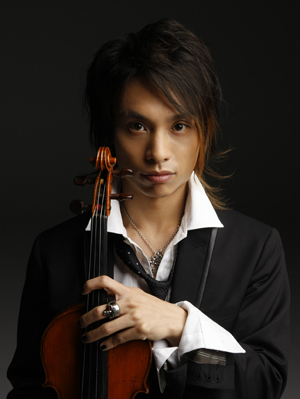 His heavily rock influenced violin play style, along with his composition make for a refreshingly new sound. The heart-warming, yet aggressive sound of his violin has charmed many from numerous generations. On November 18th, 2009, debuted with the album “JOURNEY” from Victor Entertainment. Carries the hopes of many as becoming the power horse to represent the music scene from here.